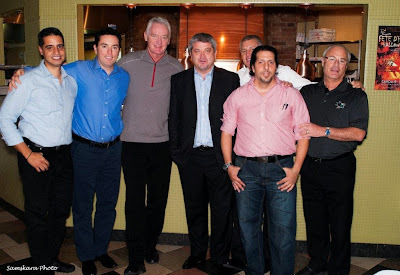 It has been a long time since Canadiens legend Larry Robinson lived in Montreal, but thanks chiefly to his agent and close friend Donny Cape a connection has been maintained with our city. Cape and Robinson became pals and business partners back in the 1980s. Robinson and his family resided in West Island Kirkland, not far from Cape’s Dollard des Ormeaux home. They ran an auto repair shop together called Dingy. Even after Robinson left the Habs to play for the Los Angeles Kings and then coach there, the bond between the two men and their families remained. It is sad and almost scandalous that the Habs never reached out to bring Robinson back here as part of their coaching staff. He spent most of his time behind the bench as a head coach and assistant with the New Jersey Devils. Prior to the 2012-2013 lockout season he left the Devils to become an associate coach with the San Jose Sharks. Habs new head coach opted in favor of Jean-Jacques Daigneault to run the defensive corps. As Robinson’s agent, Cape has handled all of his merchandising, appearances, endorsements and contracts. Very quietly, Robinson spends parts of his summer staying at the Cape home. One of the oufits he endorses is Del Friscos, the popular restaurant at the Galeries des Sources in Dollard. Commercials have been running on TSN 690 Radio for years, with Robinson insisting that this his “go to” place when he comes back to Montreal. The Sharks players (with Donny Cape front and center) strike a pose. The Sharks coaching staff, with Robinson third from the left and Cape far right. Needless to say, Del Friscos owners John, Terry and Jimmy were a pretty proud trio. Del Friscos is known for serving creative Italian American cuisine in a cozy and welcoming ambiance. The menu offers everything from traditional Italian pastas, to a variety of fresh salads, signature veal and wood-burning oven pizzas. King, a well known Jewish journalist, author, communications guru, fundraiser and former member of the Canadian Royal Air Force, passed away suddenly on October 26 at the age of 90. He was a tireless worker until his last breath, each day refusing to accept the word “retirement” and undertaking one different project after another. I must say, even at 90 Joe left us way too soon. A native of Toronto, King’s professional career took him to the four corners of the world, but particularly to the Middle East (19 visits in war and peace). His major publications included a trilogy on Montreal Jewish history (From the Ghetto to the Main, Baron Byng to Bagels and Fabled City), The Jewish Contribution to the Modern World and The Case for Israel as a handbook and DVD. King may have been best known for the decades he spent as the communications director for the local Jewish Federation of Community Service. Then known as Allied Jewish Community Services, King reportedly retired in 1988. He subsequently resurfaced as a communications advisor for several organizations and then assumed the role of executive director of the Canadian Friends of Tel Aviv University. He remained at that post until about 15 years ago, moving on to dedicate himself to writing books and giving lectures. King was a familiar site around town, walking the streets with his small brief case. His press releases went out fast and furiously, usually written at 4 a.m. Dubbed the “Historian of Jewish Montreal,” King poured 40 years of research into his book book From the Ghetto to the Main. In 30 chapters, his research has turned up sensational findings on the Canadians who schemed to prevent Jews from escaping Hitler’s Europe while assisting war criminals to enter Canada. In one instance, he found that, when the French government sent a warship to bring a convicted (in absentia) killer of Jewish children back to justice, he was tipped off by a Canadian prime minister and fled. King’s career began with The Canadian Press News Agency and then their broadcasting division, Press News, with a time-out to serve in the Royal Canadian Air Force in World War II. He was a pioneer in television public affairs broadcasting and, at CJCHTV, Halifax, originated with the support of Senator Findley MacDonald, the hour long television news and public affairs telecast. 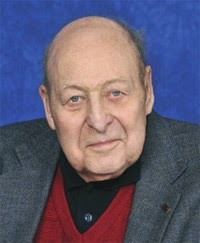 He was one of the first public affairs broadcasters on Canadian television, a co-founder of the CTV station in Halifax (CJCH-TV), and came to Montreal in 1960 to work at CFCF Radio and Television, in part because of the city's much larger Jewish community. King met and interviewed some of the most important individuals in history, Canadian, Israeli and world. He researched, wrote and hosted a television documentary, Cosmonaut and Capitalist, with the world's first spaceman Yuri Gagarin and Cyrus Eaton, who sought to build bridges between the United States and the Soviet Union during the Cold War. 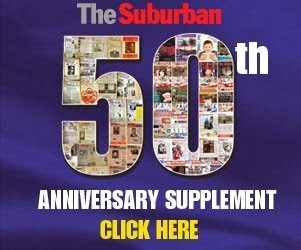 Only last May King launched a trio of handbooks, a “mini-reference library” in the fight against anti-Semitism and the campaign to destroy Israel. Federal cabinet minister Jason Kenney attended as a guest speaker.